BackBaller® is the equivalent of having a full-time physical therapist on standby in the comfort of your own home. REVOLUTIONARY NEW DESIGN - a revolutionary piece of equipment for rehabilitation, stretching and mobility, the uniquely-designed, dual-mounted foam rollers help rapidly relieve aches and pains in the shoulders, back and legs, effectively loosening tight knots and dissolving tension in the muscles. RAPID RESULTS - The ergonomic and highly stable design of BackBaller® makes it easy to simply lie down and start rolling: the blunt, toothed surface on this new, improved model produces immediate results, kneading deeply into the muscle fibres as you roll. 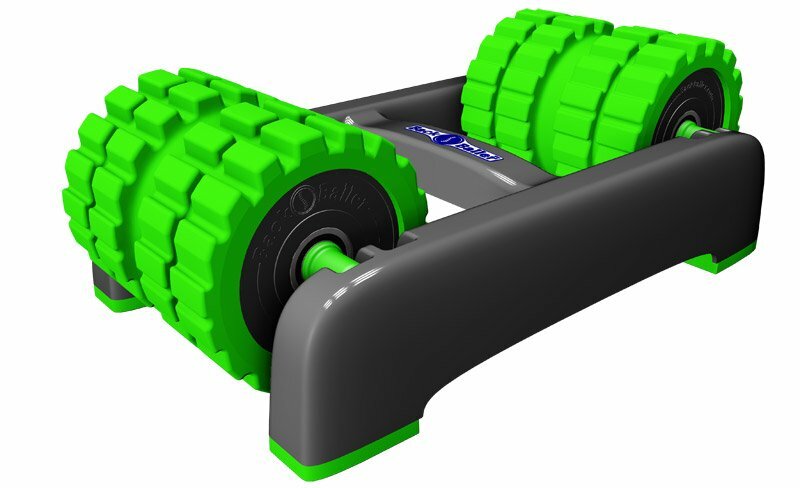 ROCK SOLID STABILITY - unlike standard foam rollers, BackBaller® features two (removable) high-density EVA foam rollers mounted into a solid base, each of which can be used individually or together for targeted muscle relief and providing significantly more stability than traditional single tube rollers. THE PROFESSIONAL STANDARD - used by many professional athletes and teams around the world. See images for some of the more high profile sports teams that use BackBaller.